The other day David really wanted to take a bath. He kept asking and I kept putting him off. A few minutes later I hear the bath water running. He decided I was taking to long so he was going to do it himself. 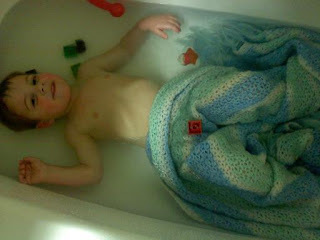 He doesn't know how to adjust the temperature of the water so when I went in to help him this is what I found. . . Apparently the water wasn't warm enough. This kid cracks me up! I think he and Eli would be good friends! What a clever kid! "I"m cold, I need a blanket." I never would have thought of that.